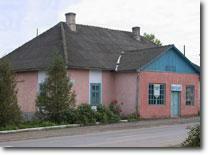 The museum of Tovste is located at Ukrainska Str., 109, on the main road passing through town. The small building is at the heart of Tovste, both figuratively and literally: it bore witness to and holds much of the fascinating history of the town. It is also centrally situated, in a geographic sense, at a crossroads that leads in all directions. 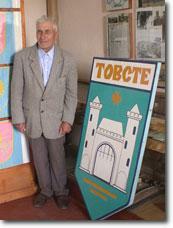 The museum owes its modest origins, in the mid-1960s, to Mykhailo Zolotyy who was principal and teacher of history at Tovste secondary school. At the time, he created the so-called ‘History Corner’, which rapidly grew in importance. As 150 exhibits were collected, he decided to allocate two classrooms in a small, separate building, for their display. It was in this small house that Tovste’s museum was opened, under the direction of Jaroslav Pawlyk, then in his 30s. Mr. Pawlyk (pictured here) went on to devote his life’s work to the maintenance and upgrading of the museum, and remains its director to this day. In 1973 it was decided to transfer the museum to a new building, the former Polish landlord’s ‘palace’. It remained there until 1989, when some town officials decided to use the space as a dwelling for collective farmers. A new home had to be found for the growing museum. The small community centre at Ukrainska Str. 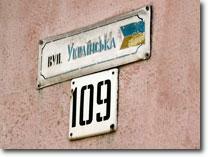 109 turned out to be the perfect location – in part because it had a rich history of its own. The centre had been established in the early 1900s as a library or reading room, known as Prosvita or ‘Enlightenment’. Details can be found in the Lviv archive. The building took many years to finish, as it had to compete for limited resources that were destined for the construction of the Greek Catholic church. Rooms were added one by one over time, resulting in the compact structure one sees today. The building was in need of repair in 1989, before it could assume its new role as a museum. The Litiy plant and Druzhba collective farm donated money for capital repairs. A local artist, Stefan Dolynchuk, decorated the first two rooms of the museum; while the rest of the rooms were decorated by local craftsmen under Jaroslav Pawlyk’s supervision. The museum was formally inaugurated in 1990 by the decision of Zalishchyky District Board no. 143, dated 20 July 1990. On 29 December 1992, the Ternopil regional culture board on conferred upon it the honourable title of “Peoples’ museum”. Regrettably, until now, limited resources have not permitted the preparation of informative signage to accompany many of the exhibits. Plaques in Ukrainian and, ideally, in English would be extremely useful, since a great number of the exhibits have a fascinating story to tell. If you would like to contribute to the further development and upkeep of the museum, please use the Feedback page to indicate your potential support. Pawlyk, J. History of Tovste. Chortkiv, 2000, pp. 100-1, and pers. comm.